Updated 10/3/2009 - see correct answer at the bottom of this post. 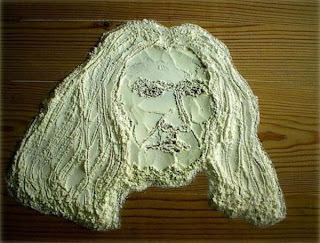 I guess you wouldn't believe me if I told you that while I was baking scones today this vision of Jesus appeared in the flour. No, I guess not. It's a little far fetched isn't it? Even though flour is a fun medium to play with. Well then, let me try this. Which one of the following five statements about me is not true? 1. In 2007 I appeared in a full page story in one of Britain's Sunday papers. The British press is something else. 2. I was doing a politician's makeup once for TV when he fell asleep in the makeup chair. I was in the middle of giving him a black eye (with makeup) as a practical joke when he woke up - thankfully he had a sense of humor. 3. I have been to Paul McCartney's home in St John's Wood, London. Very interesting. The chickens he had running around his yard disturbed me greatly. 4. I am so allergic to bees they could kill me with one sting. 5. When I was twenty I went off a cliff. I was returning from Afghanistan and I’d picked up a local bus in eastern Turkey. During the night, the driver fell asleep. The bus crossed the midline, ricocheted off a truck coming in the opposite direction, and when it finally came to a stop, nine people were dead. I have rarely travelled on a bus since. How good are you at spotting lies? It's tough no matter how clever we think we are. Things aren't always what they seem are they? Oh the tangled web we weave when we practice to deceive. Apparently the average person tells three lies in every ten minutes of conversation. It's an often quoted statistic and one I find alarming. Depressed people are more honest than mentally healthy people but when they become healthy again they become less honest again. Imagine. I know how damaging lies are. I was once was in a relationship with someone whose life was a lie from A to Z. I discovered it all a bit late in the day. Sad. And totally unnecessary. It's a topic that fascinates me for obvious reasons. I have done a lot of research now on why people lie, why we ignore the warning signs and how we can determine when people are lying? The only difficulty is that people with certain borderline personalities will lie as naturally as they draw breath. Even experts will not detect their deceit. So fingers crossed you never run into the 4% of sociopaths who exist in the world. I am enjoying the new show Lie to Me about Dr. Cal Lightman who can detect the truth by analyzing a person's face, body, voice and speech. When someone shrugs his shoulder, rotates his hand or raises his lower lip, Lightman knows he's lying. He is the world's leading deception expert, a scientist who studies facial expressions and involuntary body language to discover not only if you are lying but why. I think it should be compulsory viewing. If only it were as simple as the “liar, liar, pants on fire” nursery rhyme to tell when a person is lying to you. Ahhh, yes, if only their lying pants would burst in to flames life would be so much easier. Unfortunately liars rarely spontaneously combust and so we must find other ways to identify when somebody is being untruthful. Barring a blazing miracle the only shot that those of us who do not have a lie detector handy have at recognizing a liar is good old fashioned instinct. Check these online quizzes here. They are fun to do. If you want to find out the tell tale signs to watch out for then read this. But remember, don't focus on the lie as much as the reasons for the lie. UPDATE 10/3/09: OK, the reality. Four of the five things are true. 1. Yes, a full page spread about me was in the British press in February 2007 about my time living in the UK. Maybe I will blog about it sometime. 2. This is also true. I used to do makeup work on the side from my regular management job after I did my theatrical makeup course. I could never make up my mind to do one career or the other, so I did both and combined them. At one stage I used to make up people for television. This guy was a Minister in the Australian Government who has since retired. We used to play lots of practical jokes (yes, immature) and when he fell asleep in the chair, we gave him a fake black eye and intended to remove it just as quickly. He woke up and laughed and ......we kept our jobs. Politicians can be funny people. 3. This is not as grand as it sounds but this is also true. When working in London I spent time in Abbey Rd Studios after winning a competition ( I was selling Walls ice creams in Earls Court at the time so it was a big deal). I was with the head of the studio and the musical director and we called at Paul McCartney's home (or one of them) which was right near the studio. He had chickens running around his yard in the middle of this posh suburb. I think his first wife, Linda, was a wonderful down to earth person who grounded her family. 4. Yes I am allergic to bees and mangos and beans actually. 5. This is untrue. Although some of it is based on a true story which is what some liars will often do. Weave truth and lies together. In reality I was 33 and in a bus crash in Melbourne, Aust. I was in a shuttle bus coming from the airport. It was raining and we crashed into a tram stop. The driver and a passenger died and the rest of us ended up in hospital. I have been wary of bus travel since. Many of you got this right because as Mark said, there was a lot of detail in that statement compared to the others. You are good! I am impressed. It's hard to read between the lines when you can't see the body language. Thanks for your comments everyone! Keep living authentically and learn the signs to protect yourself! I hate to lie! I´m really really bad at it and afterward I feel awful. And I´m really gullible too. So I would just have to guess which one of your 5 is a lie. All of them are really interesting and sound like you have had many different experiences in life. Nr. 2 sounds like you are a riot. I want to believe you did that. Nr. 3 is believable too. I´m going to guess Nr. 4 is a lie.?? Please tell me all 5 are true!! That would be awesome.. except the part about 9 people getting killed. I can actually lie quite well.. have a good pokerface going! Not sure if I can get away with it with an expert though! I'm not sure I can 'guess' at your items, Lilly - great post! Cheers and here's to truth-telling (and receiving). I'm really terrible at detecting when people are lying. I once married someone based on a lie and it took me 13 years to finally figure out it was bs. Since then I've watched shows and read books on it (and gained some life experience), but Old Dog is still much quicker to spot a liar. He says it's because I only see the good in people. Which is probably a lie. Lilly, very interesting post. And i somehow think the stuff about Afghanistan and Turkey and going over a cliff is not true. ( I always thought that all commonwealth types always went to Malta for some reason). These days things are so bad, that the first person I am convinced who is lying, is the person who earnestly , with tears in the eyes, says "But, I cannot tell a lie....". I wont be surprised if some folks find out Dr Lightmans technique, and really polish up on gestures and moves to fool him. Sounds like I am depressed ? Nah.... Just very very honest ..
@ Betty - I will let you know which one is completely untrue on my next post. Yes some drama I coud have done without in my life I have to say...I clearly had to learn lots of lessons, lol! @ Roshni - oh I bet your face would tell the truth, its all in the mouth, hands and eyes. @ Carolyn - yes I do love to cook that is definitely true! I too think honesty is critical simply because to deceive causes so much pain to others. Sure there are white lies but sometimes people just get into the habit and the lies grow. I shall go and check out your post, thank you!! @ Jeanne - I think we are alike. We should compare stories one day if you are game! Glad you have Old Dog in your life because some of us are too trusting for our own good. Its sad we just cant be like that I think but the more you read the more mistrusting I become. @ Ugich - no, you are not depressed you are just down to earth and tell it like it is. I like your style a lot! I have never been to Malta by the way! i'm guessing it's the 5th one that's a lie but that's just a wild guess! couldn't tell. the statistics you revealed here is scary though... i hope it's not true. Good Sunday morning to you, Lilly. Outstanding topic ! I don't know which one about you was a lie - was it Paul McCartney's home ? I'm usually QUITE gullible. I tend to trust very easily - EXCEPT when it comes to financial things, and then all of my business training quicks in quite easily. It is so hurtful when someone lies to you, especially if it has gone on for a while because it so shatters your feelings of trust, not only in them, but in your own judgement. I think the untrue statement is 4 because that one sounds the most plausible. There are more liars around than ever. One thing to remember is that love is blind. Its true so lies will be most used and believed between intimate partners. We need a truth serum, alcohol sort of works.....good topic and I am off to try those quizzes. I am clearly hopeless at telling truth from lies I scored 58% in that quizz. I think I had better be careful. I scored worse Lilly. I got 42%. If it was easy the police would catch more criminals. Makes me think though. I trust my instincts, which often times leads me in the right direction - but not always. I've recently had the experience of someone lying to me about something very important over a significant period of time. It's devastating. My instinct guess was #2 - my logical guess is #3. Can't wait to read your next post and find out the right answer! For some reason I'm hoping #5 isn't true. I've been known to tell a lie now and then. Not really proud of it, it just sort of happens. Usually just little ones to make life easier, although I did concoct an elaborate story about how I met my husband to tell my family. (I was embarassed I met him on the internet). I never did fess up. Lilly this was a most interesting post. It really makes you think. I try not lie unless it's absolutely necessary and have trouble knowing when people are lying to me. (Until I eventually clue in) Thus, I can't tell which of your 5 things are true or untrue as they were written up in so much detail. Off to take your quiz. I'm not very good at telling lies, although white lies are easier - as long as you can't see my face! Guess I'll be on the edge of my seat until you reveal all in your next post! Yup, I'm below average in those tests, but a good one to send to fam and friends I think! I would hope that the bus trip was a lie because I hope you haven’t been through that. Something tells me that it’s true though. I pick the politician. I think you thought of it but didn’t go through with it. Lies that contain truth are the hardest to detect. I think the statistics you quote are averages, so to balance those that constantly lie; there are those who more consistently tell the truth. I hope I am in the second part of that equation. I'd guess #4, the bee thing. But then again, I married someone who clearly was lying to me from day one about the integrity of his character so let's not assume my judgement is remotely good when it comes to spotting a lie!!! Well, I think they are all so believable. Except number 5. That one is just wild. So wild, in fact, that it is probably true. I'm going to go with number 4. Lilly I always love reading your posts. You have an amazing ability to grab us from the first sentence and keep us enthralled until the very end! I love it!! My guess is number 4! Since you are out photographing those gorgeous flowers so often. I tend to believe that would not be a smart way to spend your day if you were deathly allergic to bees. I think you are smarter than that. But, you may just carry your epi-pen and call it a day in the life. I'm sticking to it though. Number four is a lie! Another great post, and one we can all relate to unfortunately. 75% not bad, but then again, am I telling the truth ? All 5 are pretty darn incredible but I just have this sneaking suspicion that they're all true or they're all false. I like your flour picture, by the way. Unless you are 12 or 13 I am horrible at spotting a liar. I don't lie well because in the end I can never remember the lie that I told!! You have to have a great memory to be a good liar...and sadly my memory is not what it used to be. I am with Julie-- usually if I tell a lie it is because it will make my life easier or to avoid something that I have no excuse for not doing!! As an aside, you highlighted the only good thing about depression that I knew of. There are lots of reasons for this, the most plausible is that people who are depressed don't have the energy it takes to think through a lie. I hope that #5 is not true! I'm an awaful liar! It's like a big red sign flashes on and off on my forehead, saying LIAR!! LIAR!! @ Rachel, yes the statistics are repeated often but as Jon says later who knows what's a lie! I think that as Frank said some people lie with every word and others do not. @ Loving Annie - glad you are like that in terms of the financial side of things. Yes I think when someone who you are close to lies to you knowing that the lie is going to be damaging but keep going with it, is just plain evil. Breaching someone's trust is horrific. Having been hurt badly I would never do it to somone else. Uncovering lies is like a bandaid being pulled off very slowly. The truth hurts but deceit hurts a whole lot worse. @ Sarah - no alcohol is not a good one because while people may be more inclined to tell the truth they are also more inclined to exaggerate and become creative, he he. @ Debra - yes that is hard when you think one thing and have thought that for a long time and make decisions as a result of that fact and then find out its a lie. You will never trust that person again. I have the view we should never trust a person 100% anyway. Also look at why they told the lie as opposed the lie itself. @ Julie - well the lie was not going to harm them and I think many people do the same. Times have changed in a very short timeframe and now one in eight couples who now marry meet on the internet. I can understand that one as your family may have worried - it was kind of taboo for a while there but no more I think. @ Christine, the interesting thing I have read is that when someone lies they will tell you a lot of detail. You cant always pick it though but over time the detail about that same lie may change. I used to think everyone was reasonably honest when it came to the things that matter but now the reality is people will lie for the strangest reasons all usually to do with their own inadequacies rather than anything to do with the person they are lying too. Except if they are trying to con them out of something. It is interesting. @ Lady Fi - yes well no-one wants to tell somene the truth if there is no reason they need to know it and by telling them you are going to hurt them. Unfortunately some people use this as an excuse though. Like a partner who is having an affair but keeps denying it because they think they would hurt their partner if they knew the truth - and what happens when their partner finds out - a great deal of pain. Its a tough call but I think all of us know where the line is. @ Frank - I wish you had a blog so I could go visit you. You make a lot of sense. Lies that contain the truth ARE the hardest to detect. My ex as so good at that. It all sounded plausible and just when you think something didnt sound quite right, out would come something that really was the truth or based on the truth. It went round and round until it was a tangled mess. @ The Mind of a Mom - well I have lied to you here, sorry. The internet is the WORST breeding ground for deceit simply because we cannot see other people, hear them talk etc. You read so much form someone's face. Its much easier to lie in writing I think. Sad if you have formed a friendship with someone and they are acting like this. You will be wary now and thats a good thing. @ Julie - yes there are a few of us in similar positions. Lots of reasons why but the thing is we have to know that people who are that evil will lie to anyone. It is the way they do things, it is not personal. They truly are damaged and probably will never even accept that they do lie. Sad the damage they cause particularly when you have never been around anyone like that before. You will never let it happen again. @ Rhonda - well I will let you know. I am thinking you may be the type to have good instincts about people, no? @ Sandi - thanks for your comment I appreciate it. Yes we all can relate to it and we just need to get better at body language etc so we can be a bit more strategic when talking to people who are lying to us. It is too common. @ Tabitha - thats a good thing that you know that about those closest to you. And that you are wary when it comes to others. That is healthy. @ Jon - well that is very good with that stat. If you were lying then that would be one of those lies that dont really matter except to you. It is really not hurting anyone else. You sound a good reader of body language! @ CJW666 - yes that is true we look for plausible things dont we? The more strange or impossible the story the more chance we dont believe. Expert liars are good at throwing in plausible stories which we cling to - its fascinating how the human brain works. If all these crooks and con artists put their brains to something beneficial how great a world would it be to live in. @ Kay - no, one statement is false and the rest are true. Strange as it may seem. @ Me - yes good liars have great memories and the more their lies are accepted the more they will tell them. I was with someone for 4years who told me the same stories during that time. Even when I grew suspicious towards the end he would deny he was lying. Its human nature to believe people because if we didnt the world would be quite dysfunctional. It must take enormous energy to keep it up and consume a lot of your thinking. Life is hard enough as it is. That is why police question suspects for hours waiting for the details of their stories to get muddled. @ Debbie - yes I think all kids try and push the boundaries to see what they can get away with. And they do because most of it is harmless. I just think its something we need to stop in children if we can quickly before it becomes a way of life for them. They do it not for sinister reasons though. @ Pouty Lips - yes its interesting about the depression thing hey? People just tell it like it is and do not have the capacity to elaborate or lie. Its a good thing to know too. @ Gran - I am betting you are a person who is pretty adept at figuring out people Gran. As for this lie in my post, we will have to wait and see. @ Joanie - yes you are too straighforward to be able to get away with it anyway. I love the way you are. Fearless in many ways and a good sense of self. @ Yellowdog Granny - yes you are another one that tells it like it is. As for the lie well in another day or so all will be revealed. Thanks for your comment as always. I did ok on those test but I think I am as gullible as the rest. I also really like that show too and isn't it based on some Californian psychologist? Its truly fascinating the ability to read body language and facial expressions. That is why I do not trust the internet entirely. As for voting I think No 1 is not right only because you live in Australia not the UK. Interested to see which one was not true. I think #2 is false. Lies - our mopped head ex-governor G-rod has a career on that. You may have heard about it since he likes to talk to the media. I'm sure he would go on any talk show even downunder. Nope, I can't do it... pick one that is. Somehow or other I could see each and every one of them both tragically or magically played out. But I'll admit I am really curious to know!! Maybe if I don't have to make a snap judgement and get to know someone a little, than maybe if they do something out of character you can tell if someone is lying more easily or not? For some people I think its a habit and they can't escape themselves... and yes, I think that speaks to the reasons they lie. @ lisleman - yes I like that song and yes I ahve frequently had songs stuck in my head too. @ vicky - Yes I think lying totally comes from people's poor views of themselves. And you are right they always say that it takes a while sometimes to figure out a liar but you always will eventually.Sometimes I wish parents realised that its a habit that needs to be broken at a young age. I woudl love to be a parent all over again with the lessons I have learned. @ TheChicGeek - well I would love you to do a post on your experiences with your work in terms of how you detect a liar. Yes its true about the Sociopath. I met one up close and personal. Hard to even fathom how they work. They charm everyone around them until they close the door. I think I may have met another one in the workplace once but it was far easier to handle I just left. Thanks for your comment. I appreciate it. People may exaggerate the truth but to lie knowing full well it is done to deceive someone then is pretty poor form. It happens far too often and is an absolute shame. Living authentically should be something we all strive to do. Its just for some reason that people find some lies more acceptable than others. Its almost considered a sport to lie to the Inland revenue department (Tax office) or or other government department. I think No 4 is the lie in the list but its hard to tell isnt it? I must admit to telling "white lies" so as not to offend people. And I exaggerate sometimes for no particular reason or to make the story sound better. But if I ever do tell an outright lie I am sure my body language gives me away. Now as for which statement is NOT true.....I know for a fact NO. 2 and 3 are the truth as I remember reading about them on this blog. So my guess would be NO. 1. Have a wonderful week ahead Lilly! @ Magee - yes that's interesting, we do seem to think that some lies are ok and others are not. People brag how they have got round paying tax as though its their right but if someone stole from them I tried to con them they woud think differently. Interesting thought. @ Peggy - yes I think we are all the same. Oh you impress me with the fact you have read my blog so we wil see in the next couple of days. @ Jade - hope you have a great week too! It hurts to be lied to by someone you care for. It's like, am I not worth the truth? My guess? Hmmm ... I think all 5 have the potential to be true. If you were in that horrible bus accident, thankfully you are okay. Perhaps the full page story in the paper? I am thinking #5, also. I hate people that lie and don't even want to be around someone that does at all. I can usually tell after a while if someone is lying because they will say or do something to trip themselves up or give themselves away. If you don't lie you don't ever have to worry about what you said. I try to always tell the truth. Great post. #4??????? That's just a guess. I'd have to see the look on your face when you made these statements. Lilly, I'm hoping it's the one about the bees. Loved Debbie's comment and your response to it! I love this subject. I also love the new show Lie to Me. Very interesting. I would say that the last one is a lie because it is longer then the rest, you explain too much. thanks for the interesting links. I lie well but won't unless forced. I've been clinically depressed twice in my life and I believe you are right in that you don't lie while depressed. Very nice topic. Will you be telling us which one was a lie? I think the make up chair and British press are false. “Depressed people are more honest than mentally healthy people but when they become healthy again they become less honest again. Imagine.” – hee hee hee! I know what you mean:) I’m quite gullible and take people at face value often to my disappointment, I find it hard to know when people are lying or being dishonest. I think I’ll go with #1... but I know I’m wrong (lol)! I dont' lie about big things. Just if someone asks a questions they REALLY don't want an honest answer too. Know what I mean? I won't lie... I know what it feels like to be lied to... it hurts so much the pain never really goes away. Trust is a huge issue... and needs to be handled with the most tender care. What a charming way to wind down my day ... smiling into the computer monitor while reading your post! You have motivated me to really think about all the lying jerks who have wandered in and out of my life .... another fun thing to do at my age. Do you think some nationalities lie more than others? Perhaps the French are better at lying than the Americans? I wonder if someone has done a study on that. great post, and thanks for your nice comment on my blog. Hi Lilly. Great post. I can never tell when I am being told a lie. My kids could tell me a whopper and I always believed every word they said! You have twisted up my mind with this one...I want to say # 4 is a lie but my instincts tell me it's #5. Great post, why people lie sure does confuse me. Sometimes I can tell when people lie to me but then again people still surprise the heck out of me! I had to share this one with you - yesterday I heard this song on the radio - it was a classic. "There is a guy that works down the chip shop swears he is Elvis. Just like you who swore you'd be true. He's a liar and I'm still not sure about you." Made me smile and I immediately thought of your Lies Post, had to share. Lilly, this is a great post! I wouldn't be able to lie if I had to--it's alays so obvious and I'd be mortified if I got caught. I'm great at making up stuff, but to tell them as a lie so convincingly is hard for me to do. Even when I told a lie as a prank so convincingly, I just can't keep it a secret. The minute that I conince somebody, I immediately say, "It's not real." I'm also very gullible and accepts everything at face value, so it's hard for me to decipher truth from a lie. However, since you're asking us here and one or two in the mix must not be true, I'll try to guess which ones I think are not true. So here goes: I'd say 2 and 3 are not true. I should have stayed with my first instinct. Can you believe that I picked #5 as a lie, but with further mulling over the choices, I changed it? And this is the truth, I swear! Oh that was fun though. So Paul McCartney and Linda used to let chickens roam free in their yard? I thought only in my province in the Philippines is like that. I hate to admit I can't tell a liar either. However my oldest son is the best damn liar in the free world and I know this because I have caught him in many a lie. When he was little he would rather tell a lie than the truth, he said it always sounded better if you added a little to a story or telling me what he was doing or were he had been. Nice post Lily as usual, have yourself a great week, take care friend. As a former trial lawyer whose job it was to get people to tell their story and have a jury believe it - - I can tell you that most people are surprisingly good at spotting deception! Great blog, thanks. I love the liar liar pants on fire concept...sheeesh the whole world would be walking around sporting a scorched bum! What interests me also is why people lie when they do so. If I fins the reason plausible and pardonable, I can't find the heart to condemn the lie. It is easy usually to understand when people lie, usualy one's instincts are good and reliable. What is more damaging and difficult to find out is a deliberate misrepresentation. People do it cleverly, it does not give them guilt feeling and sometimes achieves the purpose. "At this time, too, there appeared a certain man of magical power, if it is permissible to call him man, whom certain Greeks call a son of God, but his disciples the true prophet, said to raise the dead and heal all diseases. No intention of offending the sensibilities of Christians, my apologies if I have done it, I was reminded of what I had read in that book when I saw the picture. @ Vivek, no offence taken my friend, I thought that excerpt was really interesting and thanks for posting it! It was a toss up bn McCartney and the bus accident. I thought the bus accident was a bit long, and remembered that when I did something similar like this for an interview, it was the lie that took the most explaining. How weird is that? Lilly..what a good and thought provoking post. I totally understand and sympathize with you in having been with someone who life was a lie from A-Z. It was devastating and still impacts my life from time to time. I AM stronger though...and I AM RISING above that person. Thank you for being such a powerful inspiration to me! Mangoes! :( You have my full sympathies! I feel really guilty if I even try to fib a little. Interesting statistics, though. now if the average person tells 3 lies in10 minutes (ugh!!) then if you wished for spontaneous combustion n their pants, there would be alot of smoking people all around! So, you can tell if I lie as i can't stop but smirk this sort of Elvis Presley like grin where my TOP lip goes uo on the side. Kids spot it anytime--even with an exaggeration! "Depressed people are more honest than mentally healthy people but when they become healthy again they become less honest again. Imagine." --Yes, thank you Lilly. comforting thought that one. LOL. Yes, must (thinking to myself) MUSt ruminate on this rest of the day. So you see the manipulative lot have a head start. I have some awards and a link for you at my site...check it out! I am also a terrible liar. I react very badly when lied to as well. I really enjoyed the post and all the comments though! Being that I am a terible liar now, this post was excellent. However; I WAS a habitual liar as a little girl, but I've hurt too many people and decided to stop. Great post and I loved the comments! You're right about the sociopath thing. I once worked with a man who later turned out to be a murderer. At the time, I thought he was a great guy and I never suspected a thing. When he was in a college study abroad program in Germany, he killed his girlfriend. He did time in jail and then moved back to the U.S. A few years later, he killed another girlfriend. He's on death row in a Florida prison now. ps. I nominated you for a pink lemonade stand award. I was married to a compulsive liar for 13 years. I often wonder if genetics play a role in that. He had one brother that was okay but two others that were complusive liars. One was even arrested and on a popular TV news show in the 80's. My ex lied about EVERYTHING. It was so embarrassing. I never believed anything he said, even when it was true. I am the worst liar in the world. Anyone could tell if I was was lying just by looking. I do know a few people though that are incapable of telling the truth. I was guess the bus story, and then when I saw that I was right, I thought, I knew it! I can't explain what gave me the hint, maybe it was like you said, too much detail. Hey lady, just getting caught up on my blog reading, finally! I guessed the bee thing. Guess I was wrong! Yes ~ I am a depressive and I seldom lie. When I do, I walk around just waiting for karma to get me for my untruths. I really had no idea which one was the lie - so much for my psychic perception. You have had one amazing life so far. Which newspaper ran the full-length feature. The Times? ps I've seen Jesus on a piece of burnt toast. Now that you mentioned the extra details as being a sign of not telling the truth, I wonder if that applies to writing non-fction? Thanks for letting us know about Braja. I didn't realize her husband is Danish. I was born there. I wish them all the best in recovering fast. Great writing. Funny because I've been planning to write about "Lies" too... of course with a different take & without your lovely charming humor. Reading your blog is always a joy. I'm terrible at lying. Don't ever tell me about a surprise birthday party. On the other hand, I automatically presume I'm guilty if challenged on anything, even when I'm not - so my body language must be out. I ALWAYS get pulled aside by customs or sniffer dogs. I've met one of those creatures who can lie, wear it like a mask, and you don't know about it until it's too late. I married one (and divorced too) - scary position to be in, down right - hair standing on the end of your scalp scary. Interesting post. I'm good knowing when my daughter is telling lies. With some people they give off signs.